In computing, the Advanced Configuration and Power Interface (ACPI) specification provides an open standard that operating systems can use to perform discovery and configuration of computer hardware components, to perform power management by, for example, putting unused components to sleep, and to do status monitoring. Internally, ACPI advertises the available components and their functions to the operating system kernel using instruction lists ("methods") provided through the system firmware (UEFI or BIOS), which the kernel parses; and then executes the desired operations (such as the initialization of hardware components) using an embedded minimal virtual machine. First released in December 1996, ACPI defines platform-independent interfaces for hardware discovery, configuration, power management, and monitoring, and is designed to replace Advanced Power Management (APM), the MultiProcessor Specification, and the Plug and Play BIOS (PnP) Specification. ACPI brings the power management under the control of the operating system, as opposed to the previous BIOS-centric system that relied on platform-specific firmware to determine power management and configuration policies. The specification is central to Operating System-directed configuration and Power Management (OSPM), a system implementing ACPI which removes device management responsibilities from legacy firmware interfaces. Intel, Microsoft and Toshiba originally developed the standard, while HP and Phoenix also participated later. In October 2013, the original developers of the ACPI standard agreed to transfer all assets to the UEFI Forum, in which all future development will take place. The latest version of the standard is "Revision 6.1", which was published by the UEFI Forum in March 2016. The firmware-level ACPI has three main components: the ACPI tables, the ACPI BIOS, and the ACPI registers. Unlike its predecessors, such as the APM or PnP BIOS, the ACPI implements little of its functionality in the ACPI BIOS code, whose main role is to load the ACPI tables in system memory. Instead, most of the firmware ACPI functionality is provided in ACPI Machine Language (AML) bytecode stored in the ACPI tables. To make use of these tables, the operating system must have an interpreter for the AML bytecode. A reference AML interpreter implementation is provided by the ACPI Component Architecture (ACPICA). At the BIOS development time, AML code is compiled from the ASL (ACPI Source Language) code. As ACPI also replaces PnP BIOS, it also provides a hardware enumerator, mostly implemented in the Differentiated System Description Table (DSDT) ACPI table. The advantage of a bytecode approach is that unlike PnP BIOS code (which was 16-bit), the ACPI bytecode may be used in any operating system, even in 64-bit long mode. Overall design decision was not without criticism. In November 2003, Linus Torvalds—author of the Linux kernel—described ACPI as "a complete design disaster in every way". In 2001, other senior Linux software developers like Alan Cox expressed concerns about the requirements that bytecode from an external source must be run by the kernel with full privileges, as well as the overall complexity of the ACPI specification. In 2014, Mark Shuttleworth, founder of the Ubuntu Linux distribution, compared ACPI with Trojan horses. The ACPI Component Architecture (ACPICA), mainly written by Intel's engineers, provides an open-source platform-independent reference implementation of the operating system–related ACPI code. The ACPICA code is used by Linux, Haiku and FreeBSD, which supplement it with their operating-system specific code. The first revision of the ACPI specification was released in December 1996, supporting 16 and 32-bit addressing spaces. It was not until August 2000 that ACPI received 64-bit address support as well as support for multiprocessor workstations and servers with revision 2.0. In September 2004, revision 3.0 was released, bringing to the ACPI specification support for SATA controllers, PCI Express bus, multiprocessor support for more than 256 processors, ambient light sensors and user-presence devices, as well as extending the thermal model beyond the previous processor-centric support. Released in June 2009, revision 4.0 of the ACPI specification added various new features to the design; most notable are the USB 3.0 support, logical processor idling support, and x2APIC support. Revision 5.0 of the ACPI specification was released in December 2011, followed by the revision 5.1 that was released in July 2014. The latest specification revision is 6.1, which was released in March 2016. The 2.4 series of the Linux kernel had only minimal support for ACPI, with better support implemented (and enabled by default) from kernel version 2.6.0 onwards. Old ACPI BIOS implementations tend to be quite buggy, and consequently are not supported by later operating systems. For example, Windows 2000, Windows XP, and Windows Server 2003 only use ACPI if the BIOS date is after January 1, 1999, and for Windows 98 Second Edition this date is December 1, 1999. Similarly, Linux kernel 2.6 blacklisted any ACPI BIOS from before January 1, 2001. Once an OSPM-compatible operating system activates ACPI, it takes exclusive control of all aspects of power management and device configuration. The OSPM implementation must expose an ACPI-compatible environment to device drivers, which exposes certain system, device and processor states. The specification also defines a Legacy state: the state on an operating system which does not support ACPI. In this state, the hardware and power are not managed via ACPI, effectively disabling ACPI. D0 or Fully On is the operating state. Hot: A device can assert power management requests to transition to higher power states. Cold or Off has the device powered off and unresponsive to its bus. ACPI-compliant systems interact with hardware through either a "Function Fixed Hardware (FFH) Interface", or a platform-independent hardware programming model which relies on platform-specific ACPI Machine Language (AML) provided by the original equipment manufacturer (OEM). Function Fixed Hardware interfaces are platform-specific features, provided by platform manufacturers for the purposes of performance and failure recovery. Standard Intel-based PCs have a fixed function interface defined by Intel, which provides a set of core functionality that reduces an ACPI-compliant system's need for full driver stacks for providing basic functionality during boot time or in the case of major system failure. ACPI Platform Error Interface (APEI) is a specification for reporting of hardware errors, e.g. from the chipset, to the operating system. ACPI defines many tables that provide the interface between an ACPI-compliant operating system, and system firmware. This includes Differentiated System Description Table (DSDT), Secondary System Description Table (SSDT), and Static Resource Affinity Table (SRAT), for example. The tables allow description of system hardware in a platform-independent manner, and are presented as either fixed-formatted data structures or in AML. The main AML table is the DSDT (differentiated system description table). The Root System Description Pointer is located in a platform-dependent manner, and describes the rest of the tables. Ubuntu Linux founder Mark Shuttleworth has likened ACPI to Trojan horses. He has described proprietary firmware (ACPI-related or any other firmware) as a security risk, saying that "firmware on your device is the NSA's best friend" and calling firmware (ACPI or non-ACPI) "a Trojan horse of monumental proportions". He has pointed out that low quality, closed source firmware is a major threat to system security: "Your biggest mistake is to assume that the NSA is the only institution abusing this position of trust — in fact, it's reasonable to assume that all firmware is a cesspool of insecurity, courtesy of incompetence of the highest degree from manufacturers, and competence of the highest degree from a very wide range of such agencies". As a solution to this problem, he has called for declarative firmware (ACPI or non-ACPI). Firmware should be open-source so that the code can be checked and verified. Firmware should be declarative, meaning that it should describe "hardware linkage and dependencies" and should not include executable code. ↑ "APM BIOS Specification" (RTF). Intel Corporation, Microsoft Corporation. February 1996. Retrieved 2010-07-02. ↑ "The Advanced Configuration & Power Interface web page has a prominent note that links to the Preexisting ACPI Specifications page on the UEFI web site". acpi.org. July 23, 2014. Retrieved 2016-01-25. 1 2 "Advanced Configuration and Power Interface Specification, Version 6.1" (PDF). UEFI.org. March 2016. Retrieved 2016-07-31. ↑ Searls, Doc (2003-11-25). "Linus & the Lunatics, Part II". Linux Journal. Retrieved 2010-01-13. ↑ Corbet, Jonathan (2001-07-04). "Kernel Development". LWN.net weekly edition. LWN.net. Retrieved 2010-07-02. ↑ Linux Format n°184, June 2014, page 7. ↑ Hewlett-Packard; Intel Corporation; Microsoft; Phoenix Technologies; Toshiba (2011-12-06). "Advanced Configuration and Power Interface Specification (Revision 5.0)" (PDF). acpi.info. Retrieved 2013-11-17. ↑ "Advanced Configuration and Power Interface Specification (Revision 5.1)" (PDF). uefi.org. 2014-07-23. Retrieved 2015-05-24. ↑ "Limitations When Using Microsoft Windows 98 on Compaq Armada Portables" (PDF). physik.hu-berlin.de. October 1998. p. 3. Retrieved 2014-01-27. ↑ "Windows 98 on ThinkPad systems - ThinkPad General". Support.lenovo.com. Retrieved 2014-01-27. ↑ Robert Cowart; Brian Knittel (2000). Using Microsoft Windows 2000 Professional. Que Publishing. p. 30. ISBN 978-0-7897-2125-9. ↑ Therien, Guy (2000-01-06). "ACPI 2.0 Specification Technical Review, Intel Developer Forum" (PPT). Intel Corporation. Archived from the original on July 21, 2011. Retrieved 2011-08-21. ↑ Marshall, Allen. "ACPI in Windows Vista" (PPT). Microsoft Corporation. Retrieved 2010-07-02. ↑ Anand Lal Shimpi (2012-10-05). "Intel's Haswell Architecture Analyzed". AnandTech. Retrieved 2013-10-20. ↑ Wasson, Scott (2005-02-21). "Intel's Pentium 4 600 series processors". The Tech Report. p. 2. 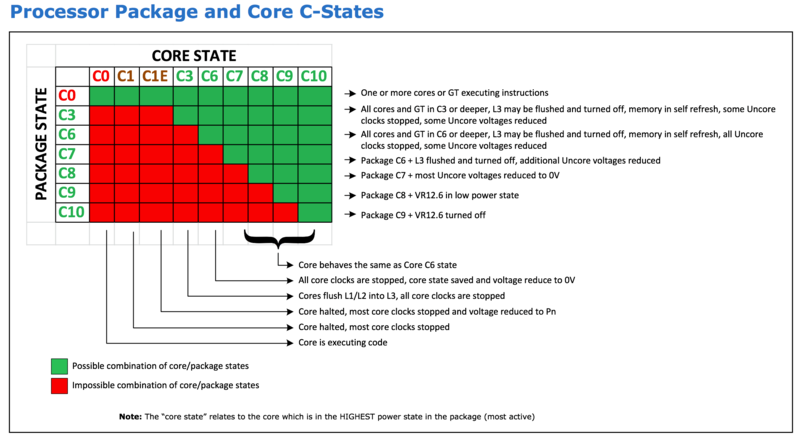 ↑ "Processor Package and Core C-States". AnandTech. 2013-06-09. Retrieved 2013-10-20. ↑ "Advanced Configuration and Power Interface Specification, Revision 3.0, Section 2.6 Device and Processor Performance State Definitions" (PDF). ACPI.info. 2004-09-02. p. 23. Retrieved 2015-08-19. ↑ Intel Corporation (September 2006). "Intel Processor Vendor-Specific ACPI" (PDF). Archived from the original (PDF) on 2012-12-25. Retrieved 2014-10-05. ↑ Brown, Len (2005-07-20). "ACPI in Linux". Ottawa Linux Symposium: 3. CiteSeerX 10.1.1.173.2206 .